In fact, Thiebaud is part of the grand tradition of representational art from Chardin and Manet to the American Realist masters such as Eakins and Hopper. Best-known for his deadpan still-life paintings of cakes, pies, delicatessen counters, and other consumer goods, Thiebaud has also explored such themes as figure studies, the topography of Northern California, and cityscapes exaggerating the vertiginous roadways and geometric high-rises of San Francisco. Continuous throughout his career is his combination of the perceptual and the conceptual, of sensuous color, light, and painterly texture with rigorously formal composition, resulting in a highly personalized Americana. 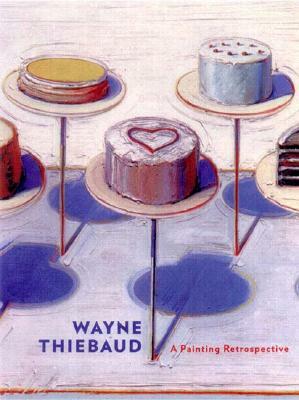 Wayne Thiebaud: A Paintings Retrospective is published on the occasion of an exhibition of the same title, the first major survey in fifteen years of work by this famous American figurative artist. Steven A. Nash, Associate Director and Chief Curator at the Fine Arts Museums of San Francisco, has organized the exhibition and provides a biographical essay on Thiebaud. An extended essay by Adam Gopnik, the Paris Journal writer for The New Yorker, links Thiebaud to American writing as a painter in the tradition of Walt Whitman, William Carlos Williams, and John Updike.